Built around 1575. as one of 273 mosques and masjids, that have existed in Belgrade in the Turkish times. Originally, its name was Čohadži-mosque, after the endower Hajji-Ali, a cloth merchant. It is a single-spaced building with dome and minaret. During Austrian rule (1717-1739) it was turned into a Catholic church. It was turned back into a mosque when the Turks returned. Hussein-bey, chehaya (assistant) of Turkish chief commander Ali-pasha, renewed the building in 1741, and, for some time after, it was called Hussein-bey's mosque or Hussein-chehaya's mosque. 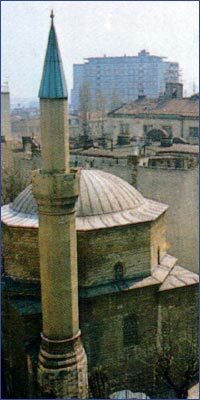 At the end of the XVIII century it was named Bajrakli-mosque, after the flag which has been raised as a sign for simultaneous beginning of prayers in all mosques. After its renewal in the XIX century, made by the Serbian dukes, it became the main city mosque. It is still in function today.